The big game could help lure relocation-minded companies to North Texas—and pump more than $600 million into the local economy. The numbers keep getting bigger and bigger: $300 million, $400 million, $500 million, $600 million or more. Throw around figures like that, especially in an economy still stuck in neutral, and you’ll get eyes opening wider, businesspeople adjusting their ties and sitting up straighter in their chairs. Such is the power of the potential bonanza that awaits North Texas as a result of Super Bowl XLV on Feb. 6. The payoff includes not just a one-time infusion of money, but the game’s longterm potential to portray Dallas-Fort Worth globally as a dynamic business market that would make an ideal home for relocating corporations. Make no mistake: we’re talking about a serious influx of cash carried by the tens of thousands of visitors who will descend upon the region early next year. Hotels, restaurants, entertainment venues, taxi companies, rental car agencies, and a host of enterprising entrepreneurs have already begun plotting how they too can grab a piece of this pie. Which raises the question: exactly how much will there be to share? No one knows for sure, but some have offered their best guess. Last May, the North Texas Super Bowl XLV Host Committee commissioned a study on the game’s economic impact by Marketing Information Masters, a California-based consultant. Completed in January, the study estimated a record impact of $611.7 million in the two months leading up to the big game. In order to be reimbursed by the state from its so-called Major Events Trust Fund, the study was submitted as required by law to the Texas Comptroller of Public Accounts. The fund will help pay for the event using sales tax revenue generated by Super Bowl fans. The host committee will receive some of the tax revenue to pay for its expenses; other money from the fund will go to reimburse the cities of Dallas, Fort Worth, Arlington, and Irving (the municipalities with Super Bowl venues) for public-safety expenditures. After reviewing the study, the comptroller’s office said in March that it would set aside $31.2 million in tax revenue to reimburse the committee and the four cities. Marketing Information Masters’ $611.7 million economic-impact figure outstrips even the host committee’s earlier estimates of more than $500 million in spending on the North Texas game, itself a record projection. The committee’s estimate was based on the belief that Super Bowl XLII—played in the Phoenix area in 2008 before a nationwide economic downtown—generated some $500 million in direct and indirect spending. Dallas-Fort Worth is larger than Phoenix, after all, and Cowboys Stadium has thousands more seats available than the Arizona ballfield. More people coming to town means more money arriving in their wallets. Some quick math: The stadium on Super Bowl Sunday will accommodate more than 100,000 spectators. In the past, host cities have found that roughly twice as many visitors come to the area than actually attend the game. Following that reasoning, North Texas could see more than 200,000 out-of-towners during that week. If you’re expecting nearly $612 million in spending, then you’re looking at the average visitor pumping upwards of $3,000 into the local economy. However, the committee’s projections include indirect spending, the multiplier effect, as well. (They aren’t counting on the average visitor spending that $3,000 directly.) That means that many of the dollars spent by those visitors are going to be re-spent locally by the businesses or employees that benefit from that new money. The wealth gets shared even further, the claim goes. Everybody wins. Some economists aren’t quite so bullish in their views of what a Super Bowl can do for a city or a region. While everyone agrees that millions of dollars will be pumped into a local economy by the game, most academics who’ve studied the performance of such mega-events peg the actual take at far less than the numbers touted by city officials and host committee leaders. But there’s even wide variation among academics, ranging from estimates of $30 million on the low end to $125 million on the high end. “You wouldn’t turn that down, but it’s a fraction … of what the NFL is telling you,” says Victor Matheson, a sports economist and associate professor at College of the Holy Cross in Massachusetts. In the view of Matheson and his colleagues, the claims of host committees or other NFL booster groups fail to deliver a true picture of the game’s economic returns, because they don’t account for important factors that affect the bottom line. It’s like the difference between gross and net profits. “I don’t have any doubt that $500 million is actually spent in the area during the Super Bowl,” Matheson says, citing the organizers’ initial estimates. “The question is how much it actually benefits the people” of North Texas. Academic types contend that much of the money spent at local hotels or retail stores that have their corporate headquarters elsewhere ends up leaving the region almost as quickly as it arrived. This is termed “leakage,” and Patrick Rishe, a sports economist at Webster University in St. Louis, says as much as 30 or 40 percent of the money spent in and around the Super Bowl city will immediately move out of the region this way. That results in far less cash trickling down to other local businesses and workers, he says. Another factor that’s often ignored in these studies is known as “displacement,” the skeptics say. Hosting the Super Bowl is a massive undertaking. The big game and its many peripheral events are expected to dominate local attention and resources for at least a week-long period next year. All other conventions and meetings that might otherwise have scheduled a trip to Dallas in February 2011 are likely to stay away. To get a true picture then of the net impact, these experts say, such “opportunity costs” need to be part of the equation. One other effect of the game may be forcing some locals to flee the area on Super Bowl weekend. Or those who may not want to be around crowds of visitors may hunker down inside their houses. Either way, they aren’t spending money locally. “They may eventually spend that money. They may spend it in the future, but maybe they don’t. Maybe they just don’t go to a movie this week, and they don’t go to two movies next week,” says Craig Depken, a sports economist and associate professor at the University of North Carolina at Charlotte. Depken previously worked at the University of Texas at Arlington and was himself an Arlington resident in 2004 when voters approved a $325 million investment in building Cowboys Stadium. He remembers stadium proponents pointing to the potential of hosting events like the Super Bowl when making their argument for why the public should help foot the bill. At the time even the Texas state comptroller was saying that the impact from a game in North Texas could be more than $400 million. North Texas organizers are doing everything in their power to ensure that they surpass economists’ expectations. In many ways, the Super Bowl XLV effort is already unprecedented. The sheer size of Cowboys Stadium itself—the largest venue to host the game since the Rose Bowl in 1993—gives Arlington a chance to outpace the impact of previous games. The NFL says that 62 percent of those who attend the game are corporate decision-makers—business leaders who can relocate their companies or bring other opportunities to North Texas. Also of note is the level of interest and support the game has generated locally. In raising a total of $21 million for its activities (as of early March), the host committee has already secured 12 $1 million sponsorships from local companies and individuals [see story here]. The North Texas committee has more than 270 members, whereas most previous hosts committees have involved no more than a few dozen local leaders in their planning. It’s also been made a regional affair here, with mayors of more than 100 cities brought together to assist in the planning and to learn how their own municipalities can participate [see story here]. By relying on a broad spectrum of leaders from all corners of the region, they hope to increase the benefits to all involved. Organizers hope also that this kind of coordinated effort will make it easier to accomplish what they consider the true financial legacy of Super Bowl XLV: attracting more business and businesses to the Dallas-Fort Worth area. The NFL says that 62 percent of those who attend the game are corporate decision-makers—business leaders who can relocate their companies or bring other opportunities to North Texas. With more than 200,000 visitors to the region and as many as 100 million viewers watching the game on television, the country’s attention will be squarely focused on Dallas-Fort Worth, providing an unparalleled showcase for the region and its relatively vibrant economy. Mike Eastland, executive director of the North Central Texas Council of Governments, says that while the Super Bowl can’t do it alone, the big game can certainly help generate more long-term business activity. As a result, regional organizers are taking extra care to target and serve the needs of these visiting business leaders. They’ve discussed how to accommodate more corporate jet traffic at the airports, even down to being concerned about not forcing any jet to spend too much time on the taxiway. They want this to be a business-friendly Super Bowl so that they portray North Texas as a business-friendly environment. Some economists, however, have their doubts that these efforts will pay off the way that organizers hope. “I’ve never even anecdotally heard of a company relocating because their CEO had a great time at the Super Bowl, and I imagine if that had happened that would be touted constantly by the boosters,” Matheson says. Hosting a Super Bowl isn’t just about getting businesses to relocate, though. There are a host of intangible benefits from the big game that have proven difficult for economists to quantify. Foremost among these is the idea that a region that offers a broad spectrum of athletic events and cultural activities helps stabilize its population and thus keeps existing businesses in place, Depken says. In the long run that sort of stability in the local population can be an attraction to corporations looking to move. 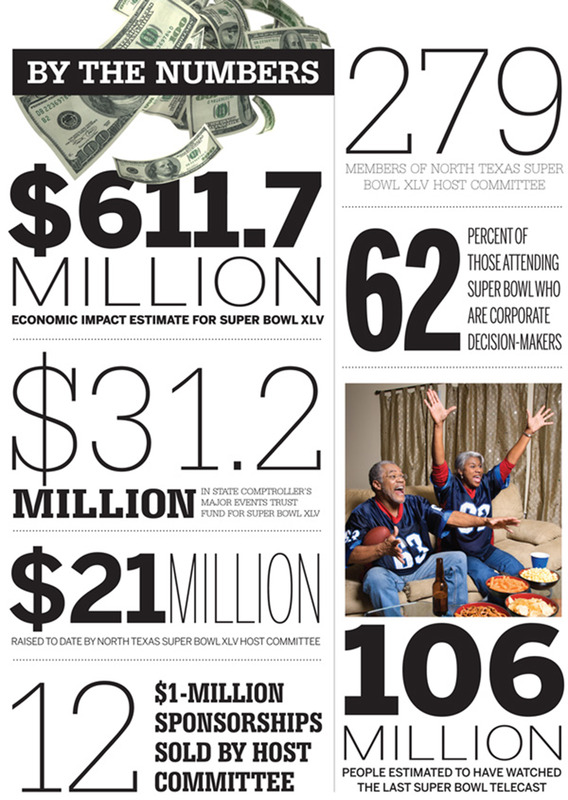 Eastland takes a similar, longer-term view of what the Super Bowl can do for North Texas. Instead of simply focusing on trying to win corporate relocations, he says, local leaders should think in terms of helping companies already based here to win more business through the new contacts they make at the events surrounding the game.